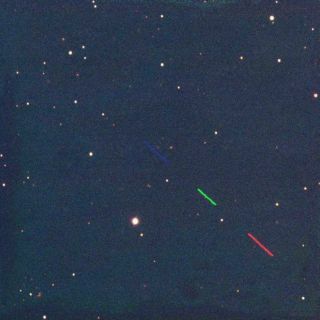 This image of asteroid 2011 MD is actually three separate observations taken in different wavelengths (red, green, blue) as seen by Australia's remote operated Faulkes Telescope South. Astronomers with the Remanzacco Observatory based in Italy took the image during the asteroid's extremly close pass by Earth on June 27, 2011. This story was updated at 3:56 p.m. ET. An asteroid the size of a tour bus zipped by Earth today (June 27) in a flyby so close that the space rock was nearer to the planet than some satellites, giving skywatchers and astronomers a tantalizing target for photos. The space rock is on the small side, with latest size estimates ranging from 16 to 66 feet (5 to 20 meters) wide. That means asteroid 2011 MD would likely be too small to survive the fiery plunge through Earth's atmosphere, let alone reach the surface, NASA scientists said. Asteroids this size can be expected to buzz Earth with close shaves about once every six years, they added. The asteroid's close brush with Earth sent it off on a new trajectory through the solar system. The space rock flew well below geosynchronous satellites, which orbit 22,236 miles (35,786 km) above Earth, but well above the 220-mile (354-km) altitude of the International Space Station. There was little chance the asteroid would hit a satellite because of the vastness of space and relatively small number of satellites, experts said. This view of asteroid 2011 MD was taken by members of the Remanzacco Observatory in Italy using a remote operated telescope in New Mexico during the asteroids extremely close pass by Earth on June 27, 2011. Skywatcher Efrain Morales Rivera snapped this time exposure of asteroid 2011 MD from Aguadilla, Puerto Rico, during the asteroid's extremely close flyby of June 27, 2011. Amateur astronomer Efrain Morales Rivera of Aguadilla, Puerto Rico, spotted the asteroid today just hours before its closest approach. At that time, asteroid 2011 MD was a small and was extremely dim, making it an extra challenge to spot, said Rivera, who posted his photos on the website Spaceweather.com. "But overall, [it was] well worth the grand effort and the weather held off for this moment too," Rivera told SPACE.com in an email. "Presently a tropical storm is upon us as I write this." A team of three skywatchers with the Remanzacco Observatory in Italy used remote operated telescopes in Australia and New Mexico to catch views of the asteroid. Two of the skywatchers, Ernesto Guido and Giovanni Sostero, are based in Italy, while their colleague Nick Howes is in the UK. One of the trio's images, taken with the Faulkes Telescope South in Siding Springs, Australia,show the asteroid in red, green and blue wavelengths, while another using the New Mexico instrument show the space rock as a streak of light on a starry background. "It was quite amazing watching it on Faulkes literally fly across the screen," Howes told SPACE.com. "We had to move the telescope four times just to keep up." Another photo of asteroid 2011 MD, this one snapped by astronomer Peter Birtwhistle of the Great Shefford Observatory in the United Kingdom on June 23, revealed the space rock as little more than a dim, moving point of light. Skywatcher Peter Birtwhistle of the Great Shefford Observatory snapped this image of asteroid 2011 MD on June 23, 2011. The asteroid zipped within 7,500 miles of Earth on June 27. Only seasoned skywatchers with medium-sized telescopes were expected to see the asteroid at all, NASA officials said. When the asteroid was first discovered, the early reports suggested that it would make its closest approach to Earth on about 9:30 a.m. EDT (1330 GMT), more than three hours earlier than the actual event. But that report was based on just two days of observations, Yeomans said. "The new improved orbit has 4 days of observations rather than two, and the current Earth close approach time is now 1:00 pm EDT on Monday," Yeomans said in an e-mail. "This time should be good to a few minutes." Trajectory of asteroid 2011 MD on June 27, 2011 projected onto the Earth's orbital plane. Note from this viewing angle, the asteroid passes underneath the Earth. Asteroid 2011 MD is the second space rock to zip extremely close by Earth this year. The other object, called asteroid 2011 CQ1, passed within 3,400 miles (5,471 kilometers) of Earth on Feb. 4, making it the closest known flyby of an asteroid to date. NASA scientists and other astronomers search for near-Earth space rocks like 2011 MD as part of a program to identify potentially hazardous asteroids that could threaten the planet.